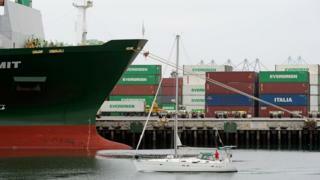 America's trade deficit widened in February as its international trade hit a monthly record. The deficit was $57.6bn - the largest monthly gap between exports and imports of goods and services since 2008, the US Commerce Department said. The figures come as President Donald Trump tries a variety of tactics to reset the balance between US imports and exports. The deficit was larger than analysts predicted, as imports of services rose. That reflected payments made to broadcast the 2018 Olympic Games, the Commerce Department said. Overall, February imports were $262bn, rising 1.7% from January amid ramped up spending on items such as civilian aircraft, computers and food. Exports also rose 1.7%, reaching $204.4bn over the month, driven by sales of oil and natural gas and automotive vehicles. The US recorded a monthly deficit in goods - the focus of much of President Trump's attention - with most countries, led by China at $34.7bn. However the gap with China shrank 2.3% from January. Wells Fargo analysts said they expect to see exports and imports grow in coming months, with strong domestic demand leading to further widening of the deficit. Trump worries about the trade deficit - should we? However, they wrote that the rising trade tension between the US and China, which have each announced plans for tariffs on $50bn of the other's goods, are a "potential fly in that ointment". "A full-blown trade war between the world's two largest economies, should one develop, probably would not cause American exports and imports to go into reverse, but it could weaken growth in trade," they wrote. China has initiated a complaint with the World Trade Organisation over the US plans to impose a 25% tax on Chinese-made imports worth about $50bn for what the White House says are unfair intellectual property practices. Mr Trump has said he wants America's deficit with China to decline by $100bn. Economists say focusing on deficits, rather than total trade, is misplaced. Video Trump worries about the trade deficit - should we? US trade: Is Trump right about the deficit?